That’s quite the list. The Box Office also states that it will operate at full 1080p resolution thanks to its Realtek RTD1073DD chipset. The RTD1073 is the third generation media processing chipset from Realtek, adding features such as DNR (Digital Noise Reduction), Blu-ray HD including AVCHD and VC-1 at a 1.25X decoding/playback rate to ensure a seamless viewing experience, as well as support for wireless 802.11b/g/n USB adapters. 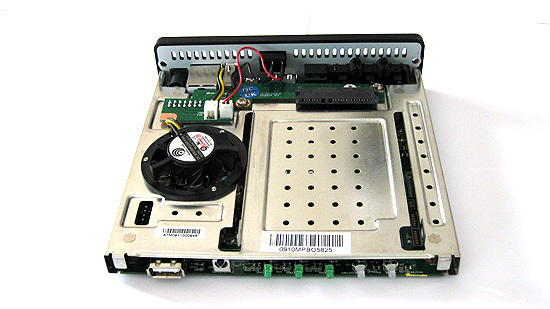 This chipset has been quite popular, and is also utilized by the Mede8er MED500X, and the Ariva HDplayer 110. The RTD1073DD handles all video and audio decoding for the Box Office. It lets Patriot build a fairly capable box without using a powerful CPU. After I took the time to rip all my movies to my PC, download virtual clone drive, the MyMovies database, purchased an ATI 5000 series video card and Cyberlink PowerDVD 9 to get full Blu-ray playback on my home theater through Windows Media Center without having to change discs or have a massive media rack filled with CDs and DVD/Blu-rays... well, I scoffed at the idea that this little box could work just as well. And I was partially right straight out of the gate, as the Patriot Box Office currently does not support any of the hi-def audio codecs (Dolby True HD or DTS-Master) but support is coming in the form of a firmware update slated for March release. Patriot was kind enough to send me the wireless 802.11g USB adapter that is normally sold separately. If you’re thinking that you can just throw an old USB wireless adapter into this box, think again. The Realtek RTD1073 chipset is somewhat picky with the chipsets it will recognize. Those Linksys adapters based on Ralink chipsets? They won’t work, so just a heads up there. Plugging the box into my power strip as well as into the receiver via HDMI, I powered it up for the first time. It has a nice hardware power switch in back to prevent power seepage while in standby. The GUI is much like the product itself with function being emphasized over form, nothing flashy here. A plain black background with simple icons greets the user upon starting up the box. The initial menu is easy enough to understand, displaying only three options. There is the option to transfer files between attached storage devices, browse your media storage for files, or enter setup. 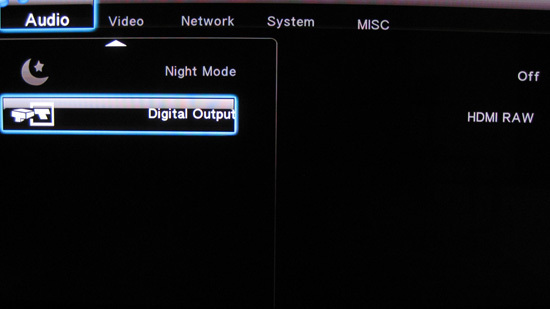 I entered the setup menu and set my display out to 1080p60 and set the audio to HDMI Raw, which will send the audio to my receiver for decoding. 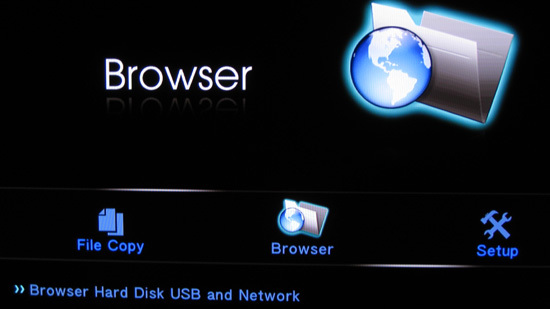 Entering the browser, there are a few options to choose from, including USB, HDD (the internal HDD), UPnP streaming, Net, and playlist. I selected Net first and found my PC promptly displayed. Upon selecting the PC however, no files appeared within! After doing some reading in the forums, it seems a few registry tweaks are needed to facilitate streaming from a windows 7 based system. Again, a sign that this product is not quite ready for the average consumer. There are three main registry tweaks required to allow this box to stream on a Windows 7 system. First requires the user to go to HKLM\System\CurrentControlSet\Control\Lsa\ and double click on “everyoneincludesanonymous” and set the value from 0 to 1. This adds anonymous users to the “Everyone” sharing group in Windows 7, allowing anonymous users, in this case the Box office to access your shared media folders. Now make sure that when you right click a media folder to share with the Box Office, you set the share group to “everyone”. Next double click on NoLmHash and set it from 1 to 0. Windows 7 does not store a LAN Manger Hash of your user password by default, and the absence of said encypted password prevents proper operation of the Box Office. From here, access HKLM\System\CurrentControlSet\Services\LanManSe and double click on “restrictnullsessaccess” and change the value from 1 to 0. Left at one, Windows 7 limits the shared folders accessible to unauthorized users, in this case the Box Office. These issues with the Patriot Box office being properly recognized are slated to be addressed in the next firmware update for the unit. I made the necessary adjustments and was off and running. 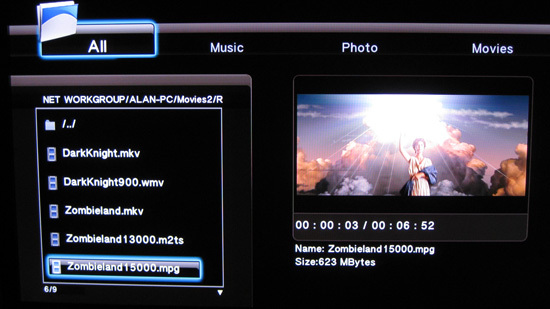 Browsing through the folder structure is okay, if you can remember where you saved various movie files on your system. When a file is selected, a preview opens up in an adjacent window. Alan, I loved your write up. Are there any plans for putting together a roundup of different boxes? I've never been able to find a place that has a good comparison of which ones are better for people who primarily want to serve their own media. I'd recommend this site for reviews of media players / NMT's. It has a ton of information and a great community. I hope it helps you with your decision! I'd also be interested in seeing a budget-htpc article... I think you guys started some mini-itx articles but never finished. I know there are lots of little pc's around $300 that can do 1080p h.264 playback and use very little power.